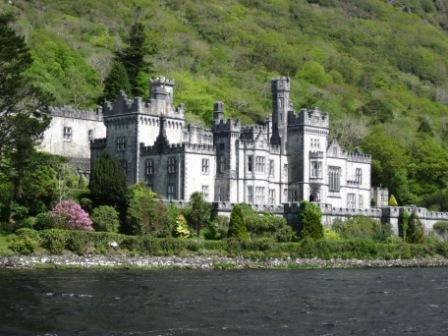 Kylemore Abbey is a large 19th century lakeside castle in the heart of Connemara, surrounded by mountains. In its hay-day, as a luxurious mansion complete with vast walled gardens, it must have seemed like Shangri-la in the middle of the untamed wilderness that is Connemara. Built by Mitchell Henry in 1867 for himself, his wife Margaret and their nine children, who would have enjoyed a fairy tale childhood, had their mother not died so young. She died just 3 years after it was finished and although Mitchell stayed on for another 30 years never remarrying, he too fell on hard times and sold it to the Duke and Duchess of Manchester, who enjoyed this luxurious lifestyle under the patronage of her rich American father Henry Zimmerman. It eventually passed into the hands of the nuns of the Benedictine order who had been displaced during World War 1 from their convent in Yprés, for the sum of £48,000 in 1920. The nuns then opened it as a day school for the local girls and international boarding school and guesthouse, as well as devoting themselves to a life of prayer and hard work. Kylemore Abbey was self sufficient due to the farm and gardens. But far from an imagined life of hard work, austerity and solemnity, the girls and indeed the nuns themselves, seem to have revelled in the beauty and tranquility of this unique place in which they had chosen to live, learn, work, play and pray. It is said 'that you never closer to God then in a garden. Sr Benedict who took the garden over single-handedly in 1958 describes it as 'her secret haven of peace and tranquillity'. Which is very much the feeling you get there today not only in the magnificent restored Victorian gardens and greenhouses, but in the Kylemore Abbey itself which is now open to the public. In the library the tray is set for tea, Irish nuns of all orders are legends in hospitality. The serene little church is newly restored and there are lovely lakeside nature walks. I cannot recommend Kylemore Abbey highly enough and although busy, there is plenty of space to be alone and contemplative, which comes naturally in such a beautiful place. 1 Leenane is a very pretty seaside village at the top of Ireland's only fjord and is where the movie The Field was filmed. 2 Killary fjord take a cruise down this spectacular 9 mile fjord to the mouth of the Atlantic, kids go free fri/sat/sundays, bar on board. 4 Avoca Handweavers, Letterfrack, probably the prettiest location ever for a shop. Letterfrack harbour, with a view of Tully mountain, it is a lovely place for a picnic. Known as the Possibly Shop? an indication of the treasure trove of choice that awaits you inside. 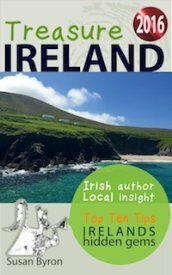 5 Inisboffin Island for a day trip or overnight stay, this is our ‘Treasure Ireland’ a pocket sized Ireland, fantastic scenery, beaches, castles, holy places, food and hospitality. Ferry from Cleggan harbour. 6 Or if you are a landlubber Drive on a bit further to Claddagh Duff where you can cross over to Omney island at low tide, for stunning view of wind and wave lashed High Island. 7 Clifden is very well known and loved, unfortunately though a little over developed of late, but not so the Sky road which has stunning Atlantic views, check out the bog where Alcock and Brown landed in 1919 having completed the first trans-Atlantic crossing. 8 Ballynahinch Castle Recess, Connemara which belonged to an Indian Maharajah, once upon a time, it is now a luxury hotel, but it is open to non-residents for lunch or dinner (both very good). 9 Ballyconeely is the wild west, stormed lashed beaches, with little cottages tucked in a under stone outcrops with nets and lobster pots piled up against turf stacked against gables, its a step back in time if you can ignore the holiday homes. 10 Roundstone very popular weekend break with the Dublin 4 set, crowded with D registered Mercedes and stuff in high season, gloriously normal the rest of the time, lots of high quality fish restaurants including O'Dowds. Traditional sailing regattas during the summer.